2014 is not starting off with a bang. At least not yet. The 4th quarter of 2013 was one of the lowest for pending sales in many, many years (2008 to be exact). This has contributed to a dramatic shift from what was a red hot sellerâ€™s market into a balanced market and even – in many areas of the valley â€“ a buyerâ€™s market. To my knowledge no major economist is predicting anything dire for the valley. Truthfully, it is not necessary to know what they are saying to see what is happening with residential real estate prices. There are only four factors that regulate the price of housing. Supply and demand, monitored by fear or greed. There are many factors that contribute to which direction the market or a market segment is heading. Probably the most important number that determines the state of the market is the current absorption rate â€“ how long the current supply would last if the rate of sales stayed the same and no new inventory came on the market. A perfectly balanced market is six months â€“ actually, a range of 5 to 7 months. With a six month supply there is no price movement and neither buyers or sellers have an advantage. If we go back many years and look at what is a â€œnormalâ€ level of inventory we see that it is 4.5 months. A 4.5 month supply will create very gentle upward pressure on prices, about the amount necessary to keep housing in step with normal inflation. Get down to a three month supply and you can see the prices rising â€“ itâ€™s a â€œsellerâ€™s marketâ€. Less inventory than that is a â€œred hot sellerâ€™s marketâ€. Around an eight month supply you have a â€œbuyerâ€™s marketâ€. These numbers are true in any market, any market segment, and in any geographic area. As you can see, from the current chart (chart 1), the monthsâ€™ supply varies considerably depending on the price range. This number also varies greatly based on geographic location. The current number for the valley (all price points and areas) is 4.9 months supply. On the inset (chart 2) you can see the recent range of the valley wide monthsâ€™ supply has gone from a 5.9 months in Jan 2011 to a low of 2.2 months supply for June 2012. One interesting observation is that the â€œfailure rateâ€ for listings in the MLS tends to go up sharply when the inventory level rises (i.e. homes that donâ€™t sell). Home sellers who have highly experienced agents who can accurately read the market do not suffer from their home not selling. It is possible to successfully market a home in any market. So what will the spring buying season bring this year? Doom and gloom or a balanced market? Truthfully, we donâ€™t know. We suspect balanced. But, the first sign of market strength (and yes weakness) is pending sales. If we see increasing sales this spring, the cooling phase of the market is over. If not, then we are likely to have a very subdued spring season that could last more than just a season. Weak or strong, as always, you will know just as soon as we do. 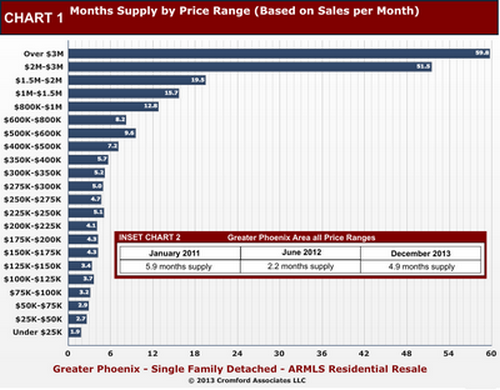 The following are still in a seller’s market: Sun Lakes, Sun City West, Anthem, and Paradise Valley. The following are in the balanced zone: Chandler, Glendale, Scottsdale, Litchfield Park, Arizona City, Avondale, Mesa, Sun City, Apache Junction, Cave Creek, El Mirage, Phoenix. The following are in a buyer’s market: Peoria, Tolleson, Tempe, Fountain Hills, Gilbert, Goodyear, Laveen, Gold Canyon, Surprise, Casa Grande, Buckeye, Maricopa, Queen Creek & San Tan Valley. As always, there are variances in individual neighborhoods, as well as price brackets. A Realtor provided supply / Demand Analysis will show which is which.